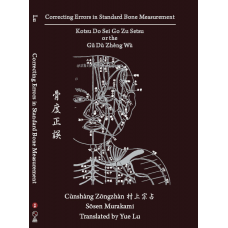 Gu Du Zheng Wu (Japanese: Kotsu Do Sei Go Zu Setsu) 《骨度正誤》 (Correcting Errors in Standard Bone Measurement) was written by Cunshang Zongzhan (Japanese: Sōsen Murakami) 村上宗占. 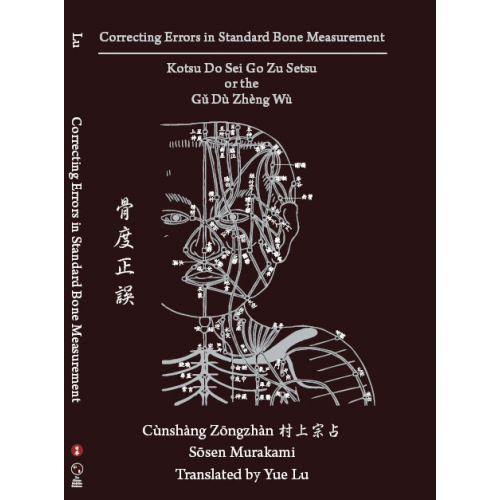 It is a tiny book packed with both drawings of all of the channels, as well as an eloquent discussion on the importance of the measurement of bones, and hence measurement of the cun 寸. Some of the drawings within would not be considered standard representations, hence these drawings offer a different perspective in to understanding the channels. Written in 1744, Cunshang Zongzhan humbly suggests that Zhang Jiebin 張介賓 and other commentators of Asian medicine actually misunderstood the proper cun measurements in the body. While this seems like a dry topic, it in fact affects the whole premise of performing the skill of acupuncture, because this text firmly expresses the idea that needle placement is fundamental to achieving results. The translation team of Dr. Yue Lu and Lorraine Wilcox have outdone themselves in translating this small text by Cunshang Zongzhan. Cunshang composed twenty essays which he wrote to convey accurate point location to his students. These essays are split between methods of accurate bone measurement and proper measurement by a string or piece of straw. Cunshang also included twenty-six illustrations in the original text. Lu and Wilcox have further bolstered Cunshang’s points by citing quotes from Huang Di Nei Jing, Ling Shu, Lei Jing Fu Yi and Lei Jing Tu Yi.